Sunday (November 29th) marked the first Sunday of the Advent Season, which signifies the preparing of our hearts for celebrating the birth of Christ – – the very best present of all time! We light a candle each week on our Advent wreath, and if you wonder what that is all about, enjoy the video below that explains the meaning of each one. We look forward to worshiping with you during this very special season! 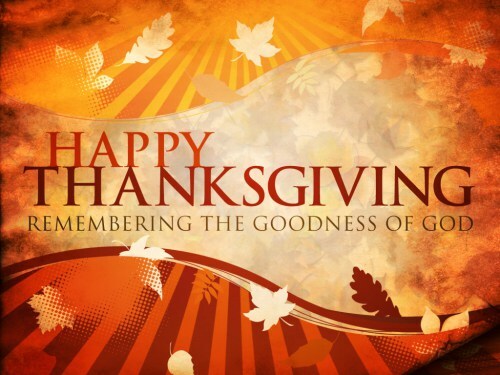 Take extra time today to thank God for all the blessings in your life…. He is always there for us! For that, we are eternally grateful! We pray that you feel his presence in your life! Have a blessed Thanksgiving! WOW! Thanksgiving Ingathering a HUGE success thanks to you!! What began in 1980 on the campus of Westmar College with a total of $44,882 in cash and in-kind gifts has grown to over $1 million presented in 2015 by faithful United Methodists at five sites – Cherokee, Webster City, Cedar Falls, Mount Pleasant, and Greenfield. Plus, $842 was collected for Church World Service blankets and $216 was sent to cover shipping costs and toothpaste for the health kits. A child’s quilt was also donated and sold for $65 at the quilt auction. The total cash and value of in-kind gifts was $2,745.00. WOW!! United Methodists across Iowa were challenged to “be candles of hope by being a part of ending hunger and reaching out to those in various need through Thanksgiving Ingathering 2015.” Thank you for accepting that challenge with your overwhelming generosity. You have helped light the world for those in need! Thanks for another successful Soup & Pie Supper! Thanks to everyone who helped make our annual Soup & Pie Supper another big success! It is definitely a church-wide endeavor to say the least! But it would not be a success without our community support! So, THANKS to everyone who came out and enjoyed some of our soup and pie that night! The Noodle Ladies come in and make “oodles of noodles” for our homemade chicken noodle soup! And then the men come and start frying LOTS and LOTS of hamburger for the chili. Hmmm…. how many gallon cans of tomatoes does it take to make our chili anyway??? And of course, you can’t make boat loads of chili without sitting on the stove, right?? And next, the Homemade Chicken Soup making begins!! And, just a few of the awesome helping hands!! And more of our “Souper” helpers! And those men still have to keep stirring that chili!! And did we mention, there are LOTS of dishes??? And even help stuffing the soup bowls back in the corner cupboard! !